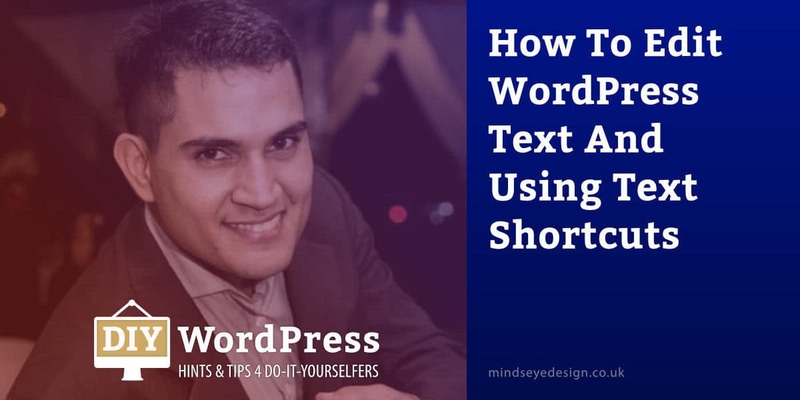 Learning how to edit WordPress text is super simple but if you haven’t done it before, we think a little guidance might help. First of all, log into your WordPress admin area and depending on what you want to edit, click on either the Posts or Pages link in the left Sidebar. Once the list of Posts or Pages has appeared, click on the title of the Post or Page which you wish to edit. Tip: Hovering over the Post or Page title with your mouse opens a sub menu, where you can choose to ‘Edit’, ‘Quick Edit’, ‘Trash’ or ‘View’ your post or page. Choose ‘Edit’. Type in your new text which will update automatically. Re-style the text to bold by clicking on the ‘Bold’ icon in the Toolbar. Change the text to italic by clicking on the ‘Italic’ icon in the Toolbar. Align the text to left, centre or right by clicking on one of the ‘Align text’ icons. Note: Within the Visual Editor, the text is only a visual representation of how your text will look on your website. It may not be quite the same but should match the styling applied to the rest of your website. Once you’ve finished editing your text, click on the ‘Preview’ button in the top right of the Publish module. This can be found on the right side of the screen (providing you haven’t hidden it via the Screen Options tab). When the preview has opened, you will be able to preview your changes on your site before you publish them. When you are satisfied with your changes, click on the ‘Update’ button to publish them to your website. Did you know that you can quickly and easily format the text on a page or post using text or keyboard shortcuts? Imagine not having to use the WordPress Editor’s Toolbar, what a time saver that would be. No more to-ing and fro-ing, scrolling to the top of the Editor to click the relevant styling button, just to style text, add a link or insert an image! Many of these shortcuts may be familiar to you already – such as pressing the Ctrl and ‘b’ buttons simultaneously (Ctrl + b) which makes any chosen text bold, and the Cut command (Ctrl + x) which removes text, Copy (Ctrl + c) which copies text and Paste (Ctrl + v) which pastes any previously copied text. Using keyboard shortcuts in the WordPress Editor will help rest your hands (good for R.S.I.) because you don’t have to keep going backwards and forwards between keyboard and mouse. They will also save you valuable time and enable you to edit your content quickly and efficiently. Just like a Pro! Typing an asterisk (*) then a space starts an unordered bullet list. Typing the number 1 then a full stop followed by a space, will start an ordered, or numbered list. Typing the ‘greater than’ sign convert text into blockquote e.g. > blockquote. To insert a hyperlink, press Ctrl + k on a PC, or Cmd + k on a Mac. To remove the link, press Alt + Shift + s on a PC, or Ctrl + Opt + s on a Mac. To insert an image, press Alt + Shift + m on a PC, or Ctrl + Opt + m on a Mac. To switch to distraction-free writing mode, press Alt + Shift + w on a PC, or Ctrl + Opt + w on a Mac. To exit distraction-free writing, use the same keyboard shortcuts (Alt + Shift + w on a PC, or Ctrl + Opt + w on a Mac). Note: More shortcuts are available in the Visual Editor than the Text Editor. For a complete list of keyboard shortcuts, visit the official WordPress Keyboard Shortcuts page.